Mission Moments: The Wait is Over! It has been a long week. We didn't get our call on Thursday; nor did we receive it on Friday. My patience was being severely tried! This morning I received a phone call from our mail carrier letting us know the call had arrived. We were cleaning our church building when she called. She let us know what time she would be by and hand it to us at the door. Fortunately we were pretty much done sop we could make it home by 9:30 AM to meet her. It's been a pretty busy day with cleaning the Chapel, cleaning our own home, cleaning and selling the wave runners, fixing lunch for family. Two of our five kids were here for the opening of the white envelope. The others were connected via Google Hangouts. Thank goodness for that. One of our kids is on a trip with his family. They pulled off the freeway by Grand Island, Nebraska so they could participate. It was family time for us. 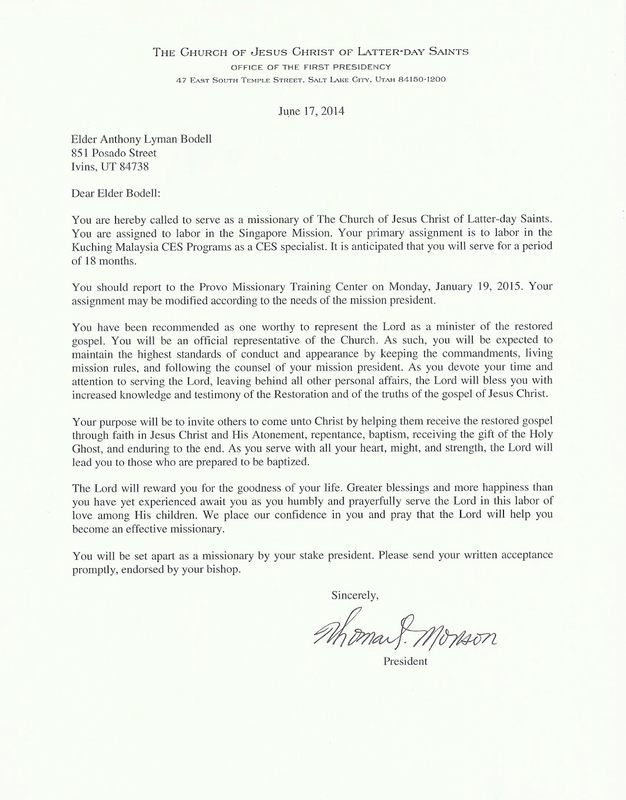 You are hereby called to serve as a missionary of The Church of Jesus Christ of Latter-day Saints. 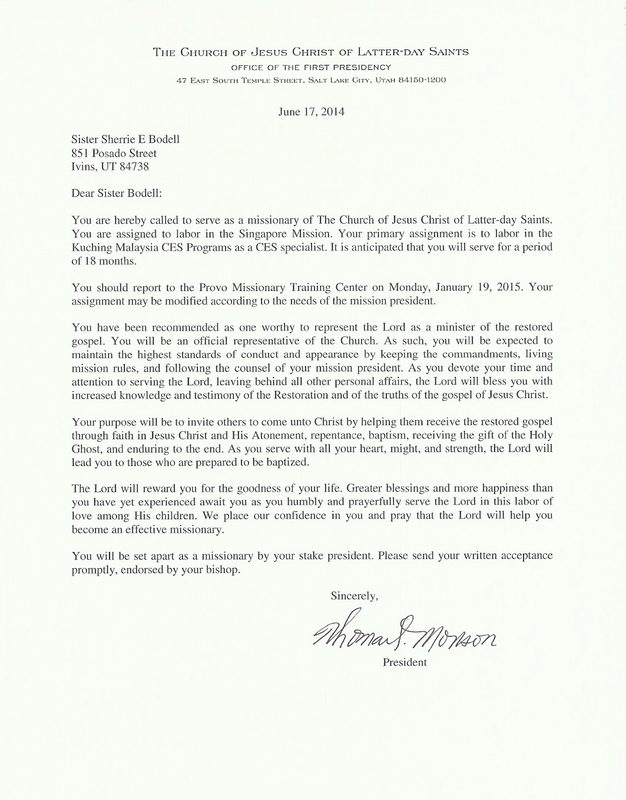 You are assigned to labor in the Singapore Mission. Your primary assignment is to labor in the Kuching Malaysia CES Programs as a CES specialist. It is anticipated that you will serve for a period of 18 months. You should report to the Provo Missionary Training Center on Monday, January 19, 2015. I was completely overwhelmed! Sherrie let me open the call as I didn't get to do that when I received my mission call when I was 19. I was out of town so my dad opened it and read it to me. This was exciting! Our family is excited, too! We are humbled at the prospect of being called and looking forward to serving. We have plenty of time to get ourselves together. Congrats on the mission call!!! Soooo excited for you!!! I'm probably going to Dave's farewell next week. I'm glad you have a mission blog! Best way to journal it!! !